S.T.A.L.K.E.R. : Shadow of Chernobyl is a first-person shooter computer game by the Ukrainian developer GSC Game World, published in 2007. It features an alternate reality theme, where a second nuclear disaster occurs at the Chernobyl Nuclear Power Plant in the near future and causes strange changes in the area around it. The game has a non-linear storyline and features gameplay elements such as trading and two-way communication with NPCs. The game includes elements of role-playing and business simulation games. The background and some terminology of the game ("The Zone", "Stalker") is borrowed from the popular science fiction novella Roadside Picnic by Boris and Arkady Strugatsky and the 1979 Andrei Tarkovsky film Stalker that was loosely based on it, as well as Stalker, the film's subsequent novelization by the original authors. On July 11 2007, GSC Game World announced a prequel, S.T.A.L.K.E.R. : Clear Sky, which was released on 5 September 2008. 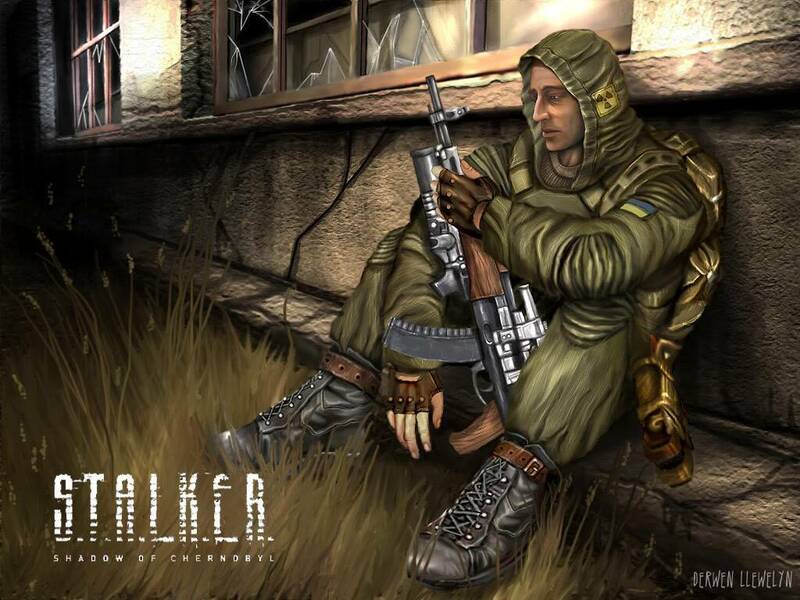 On April 30 2009, GSC Game World announced a sequel, S.T.A.L.K.E.R. : Call of Pripyat, which was released worldwide in February 2010. S.T.A.L.K.E.R. takes place in an area called "The Zone", which is based on the real-life Zone of Alienation and partly on the settings of the source novel and film. It encompasses roughly 30 square kilometers and features a slice of Chernobyl extending south from Chernobyl Nuclear Power Plant; geographical changes for artistic license include moving the city of Prypiat into this area (it is actually to the north-west of the power station), although the city itself is directly modeled on its real-life counterpart, albeit smaller in size. After the initial Chernobyl Disaster, attempts were made to repopulate the area, primarily with scientists and military personnel. However, in 2006, almost 20 years after the first incident, a second disaster occurred, caused by the C-consciousness (rus. "О-Сознание" which corresponds with "осознание" - "realisation, awareness") program, killing or mutating most of the inhabitants. S.T.A.L.K.E.R. begins years later, after people have begun coming to the zone in search of money, valuable artifacts and scientific information. In keeping with the post-nuclear decay within The Zone, extreme radiation has caused mutations among animals and plants in the area. As such, creatures within The Zone are vastly different from their real-world counterparts (which include dogs, boars, crows and many others). Additionally, some areas of The Zone contain mutated humans, the majority of whom were caught in the second nuclear disaster. Several creatures which are present in the game cannot be enabled without game modification. Artificial Intelligence of wildlife is highly developed and presents many realistic behaviors, such as fights over food and pack mentality, which can be observed in non-scripted events. The game engine was designed so that animal behavior is calculated even if the player is in a different part of the world. As a result of the second Chernobyl disaster, The Zone is littered with small areas of altered physics, known as anomalies. There are several different variations, each one having a unique impact upon those who cross its path. They can be potentially deadly to the player and other NPCs, delivering electric shocks, or pulling them into the air and crushing them. Most anomalies produce visible air or light distortions and their extent can be determined by throwing bolts (of which the player carries an infinite supply) to trigger them. Some stalkers also possess an anomaly detector, which emits warning beeps of a varying frequency depending on their proximity to an anomaly. The guide in the film Stalker, and his predecessors in the Strugatsky brothers' book Roadside Picnic, test various routes before proceeding. In the film, metal nuts tied with strips of cloth are used. Anomalies produce Artifacts, the valuable scientific curiosities that make the Zone worth exploring monetarily. As well as being traded for money, a number of Artifacts can be worn so that they provide certain benefits and detriments (for example, increasing a stalker's resistance to gunfire while also contaminating him with small amounts of radiation). Artifacts are found scattered throughout the Zone, often near clusters of anomalies. S.T.A.L.K.E.R. is a non-linear sandbox game. Players are relatively free to explore the world and have many opportunities to interact with other characters. S.T.A.L.K.E.R. is primarily an FPS, but also features many RPG elements. The player does not gain additional abilities or statistics like most RPGs, but is instead allowed to use various types of equipment that is either purchased or found throughout the game world. There are a large number of items in the game, so the player has customization choices which are constrained primarily by how much exploring they do. The game also attempts to blend the story and character interaction which are commonly associated with RPGs. However, unlike RPGs, conversation branches are extremely limited and do not significantly influence the course of the game, aside from accepting or declining missions. The Zone is a large and varied area, consisting of wilderness, human settlements, and several heavily-guarded military bases. However, the game world is not a true contiguous world, but rather 18 different maps separated by loading screens. Transfer from one area of the Zone to another can only be accomplished at certain specific passageways; a wire fence border blocks players from attempting to cross the map in any other area. When the player enters a highly irradiated area, they will begin to receive radiation poisoning. During this time, a radiation icon appears on the screen and fades through from green to yellow to red, signifying the strength of the poisoning, which grows the longer the player remains present in the affected areas. The stronger the poisoning, the faster the player's health decreases. Unless the player dies from damage caused by radiation poisoning, there are no permanent effects from contracting it other than health loss. However, radiation will persist and continue to drain health until either radiation medication or a substantial amount of vodka is consumed. The game offers multiple endings based on the player's choices throughout the game. This section assumes the player achieves the most complete ending. The game begins with an unconscious, wounded stalker (the player character) being brought to Sidorovich, a black-market trader operating inside the Zone of alienation (or simply "The Zone"). Sid is able to save his life, but the wounded stalker is amnesic; the only clues to his identity are a tattoo on his arm of the acronym "S.T.A.L.K.E.R." and his PDA which contains only one entry in the to-do list: "Kill Strelok." The amnesiac stalker is dubbed "Marked One" by Sid. Marked One repays Sid by performing certain tasks, and in the process receives information about Strelok's possible whereabouts. With no other leads to his past or the cause of his amnesia Marked One follows the information from contact to contact, tracing Strelok's past movements and learning more about his supposed assassination target; as information is uncovered he begins to recover scattered memories. Eventually Marked One follows a lead to a factory in Yantar. Yantar is the home of a Brain Scorcher, a field which effectively destroys the mind of anyone who comes within its range, turning them violent and hostile. Scientists studying the phenomenon determine that it is man-made and recruit Marked One to enter a secret lab underneath the factory to disable it, which he does. Information taken from a body in the lab directs Marked One to track down a member of Strelok's group named Doc. Attempting to reach him in an abandoned base of Strelok's, Marked One inadvertently triggers an explosive booby trap and is nearly killed, only to be rescued by Doc. While he is incapacitated Doc speaks to Marked One about the rumor of a giant "Wish Granter" artifact located somewhere in the center of the Zone, but also indicates that Marked One is Strelok, calling him by that name. Before Marked One can recover to ask any questions Doc leaves. Further leads send Marked One towards the Chernobyl Nuclear Power Plant, where the Wish Granter may be located. However, travel to Chernobyl itself has been all but impossible due to the presence of another, larger Brain Scorcher south of Pripyat, as well as the "Monolith" faction of stalkers who worship the Wish Granter and kill anyone attempting to access it. Marked One makes his way through the forest south of Pripyat and deactivates the second Brain Scorcher, re-opening the path to the abandoned city. Pripyat is in chaos as dozens of stalkers clash with Monolith forces. Marked One eventually makes it to the Chernobyl facility, also held by Monolith forces. After fighting his way through the opposing stalkers Marked One discovers both the gigantic Wish Granter artifact and a secret laboratory in the building. Inside the heavily defended lab is a large holographic terminal, through which an entity calling itself "C-Consciousness" communicates. It readily answers Marked One's questions, revealing what it is, who Marked One is, and the events prior to his amnesia. In the aftermath of the Chernobyl disaster, the Soviet Union decided to use the Exclusion Zone for special research into the human mind. Results included enhanced ESP, psychic weapons, and the eventual formation of a hivemind of seven neurally linked scientists known as the C-Consciousness. After the collapse of the Soviet Union, the self-aware C-Consciousness took control of the Zone and continued its research. It attempted to bring about world peace using global mind control; however, these attempts resulted in the unintentional twisting of the physical terrain around Chernobyl as well as the mutation of resident life forms, creating the Zone. In an attempt to hide its existence the C-Consciousness created the two Brain Scorcher fields and erected a Monolith artifact - the Wish Granter - in the center of the Zone, which it uses to brainwash any stalkers who reach it; brainwashed stalkers are tattooed with the "S.T.A.L.K.E.R." acronym and reprogrammed to serve the C-Consciousness. Rumors of the Wish Granter slowly spread throughout the Zone. A group of four stalkers (Strelok, Ghost, Fang, and Doc) attempt to reach the Wish Granter, but after encountering the fanatical Monolith faction they are forced to retreat. Strelok is knocked unconscious during a "blowout" and loses his memory while the others are able to escape. On the way back Fang is killed by a sniper in Pripyat; some time later Ghost is killed in the Brain Scorcher control facility under Yantar. The unconscious Strelok is discovered by the C-Consciousness; unaware of his identity, it mistakenly assigns him the task of killing himself. On the way out of the Zone the truck carrying the still unconscious Strelok is destroyed in a lightning storm and he is discovered by another passing stalker, leading into the events at the beginning of the game. Once the C-Consciousness has finished answering Marked One/Strelok's questions he is faced with a choice: merge with the C-Consciousness to ensure its continued existence, or stop the C-Consciousness from continuing its experiments. If Strelok refuses to assist the C-Consciousness he is transported to the exterior of the Chernobyl plant, where he navigates his way through teleportation anomalies and armed Monolith soldiers in order to reach the source of the C-Consciousness. Once inside Strelok shoots the encapsulated scientists which form the C-Consciousness. Afterwards Strelok sudden shown standing in a grassy field, watching the sky as the clouds break and the sun comes out. The Zone is apparently gone. He questions whether or not he made the right decision, but as he lays down in the grass he concludes that while he may never know what was right, he is happy that he survived. The picture made it more interesting and the Plot makes me want to play it. GOod work getting the info. Who is the injured guy? Oh, it's the major character "Marked One" . He was found half dead and he got amnesia for some reason. No one know his name and he got that nick. He guy is cool tho! He might look nor really good, but he is an interesting persona btw. I played the game so I know. You not the only one smart here. » ShortLines.ctg "ChessBase opening book for engine-engine testing"